Hardware Only,not including Door panel! 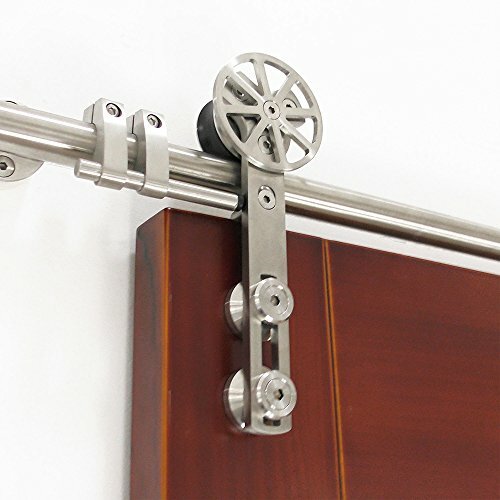 **Very high quality,very beautiful sliding roller track,when the roller move,the decorative core can move too. **Track's length should be twice of your door panel's width,pls select the size according to your door.If you need custom length,pls contact us we can custom cut the length for you. **The length from top of the door panel to the top of the roller is about 130mm,pls make sure you have enough space for installation. Floor guide:1pcs **Noted:10ft/12ft/13ft are two shorter tracks using a joint-in track connector to make two pieces to be a longer one. Material:Stainless steel 304;Surface:Brushed;Suitable for door thickness:1-3/8" to 1-5/8"
Package's including:Roller*2;Stopper*2;6FT Sliding track*1;Track&wall connector*4(fixed together track);Floor guide*1;End cap*2(fixed with track);The gap between door and wall is about 3/10" based on door thickness 1-3/8"